Configure lots of variations and features effortlessly, and have everything ready within a minute. It just works out of the box. Carefully built, extensively tested and improved over the years. Whether you're a newcomer or an expert webmaster, get the support you need. And get it fast. Improvements and new features are available regularly. Get the latest version with a single click. Clean lightweight minimalistic design. It's an essential tool to any modern website. An advanced settings panel provides the tools needed to create any translation setup. Suits best for menus and widget areas. Great when needed to have a medium to large number of languages. 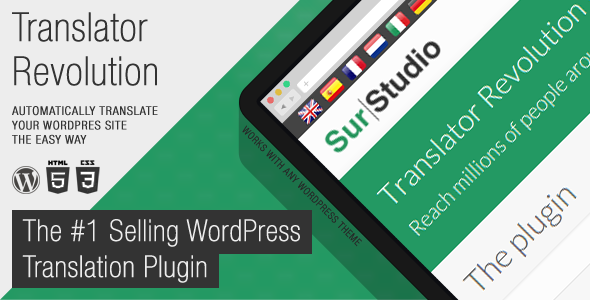 Best rated translation plugin on Envato Market of all time. Even though this plugin is the newest of this set, it's the fastest selling and soon it'll become the best selling! Suits best for headers and footers. Ideal when needed to focus on just a few number of languages. 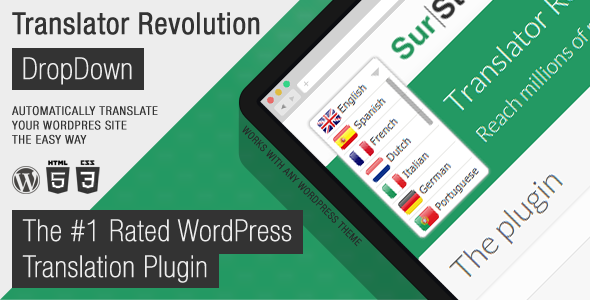 Best selling translation plugin on Envato Market of all time. Improved over the years, this plugin has become immune to conflicts with 3rd party software. Helping the drop down version plugin to achieve the same goal. The first product was released back in 2011, since then we have been improving our translators to ensure the best possible compatibility. They offer great fexibility to easily create rich content by simple drag and drop without any coding. Translate them effortlessly. Stop worrying about whether themes are built according to the WordPress Codex for internationalization, all the content will be translated either way.